HAECO Xiamen announced today that the company has received the "Most Impressive" award for a second consecutive year from the Union of Japanese Scientists and Engineers ("JUSE"), at Japan's Nationwide Quality Control ("QC") Circle Conference in Kanazawa. The winning team of six, from HAECO Xiamen's Planning Department, developed from scratch a database and software programme to assist in the identification, reverse transcription and compilation of maintenance records of airframe maintenance works for one of the company's anchor airline customers. The task is now fully automated, and the time required to complete it has been significantly reduced – by an impressive 99%. First introduced in 2014, QC circles are one of HAECO Xiamen's important improvement initiatives, as part of its continuous pursuit of operational excellence in service delivery. Frontline staff are encouraged to brainstorm ideas that may improve their work processes in terms of factors such as occupational health and safety, environmental impact, cost efficiency and quality. They will then develop these ideas in a structured manner through the use of QC tools. The winning team had beaten more than 120 QC circles within HAECO Xiamen to qualify for the competition in Japan. This latest recognition from JUSE is a great source of encouragement for HAECO Xiamen. The company will continue to nurture its self-initiated improvement culture, in pursuit of operational excellence and to bring greater value to customers. 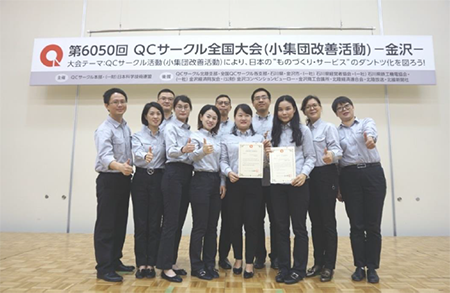 HAECO Xiamen wins the "Most Impressive" award at Japan's Nationwide Quality Control Circle Conference. Founded in 1993, HAECO Xiamen is a leading Maintenance, Repair and Overhaul (MRO) service provider in Asia Pacific. It offers a full range of airframe services, including airframe maintenance, modification, cabin reconfiguration, passenger-to-freighter conversions, and line services at 11 airports in China. The company is also home to HAECO Private Jet Solutions – Asia's first and only facility approved by Airbus and licensed by Boeing to provide comprehensive design engineering, certification, and cabin completion for private jets. As a one-stop MRO provider, HAECO Xiamen operates its own certified aviation parts manufacturing and testing facilities, and runs a public training and license examination centre. This caters to both the technical and non-technical training needs of the MRO industry throughout the region. HAECO Xiamen is part of the HAECO Group, and The Boeing Company, Cathay Pacific Airways Ltd., Japan Airlines International Co. Ltd., Xiamen Aviation Industry Co. Ltd. and Beijing Kailan Aviation Technology Industry & Services Co. Ltd. are its other shareholders. The company employs around 4,500 staff in China.